Warning! Weight gain may follow the reading of this post. Before retiring, and when we lived in America, one thing we almost never did was to go to a Thai restaurant. We found that the food served in American Thai restaurants not only wasn’t close in quality to the food served in Thailand, but the flavors were quite different and it was so sweet as to be almost inedible. It was obviously made for the American palate. A person thinking of spending any time here, but who has only tasted American or European Thai food, probably doesn’t know what a great treat he or she has in store for them. Below I have listed some simple dishes that you probably won’t find in America or Europe but which are basic everyday fare here. It’s what I eat, mainly luncheon foods. They are one-dish affairs, a complete meal in themselves. You will find them in most food courts around the country, or in roadside or pushcart restaurants. The dish, with a drink, will cost you about $1.50 – $2.00 almost anywhere in the country (although some big hotels and fancy places might charge many times that amount and probably won’t be near as good). Please note that when I first returned to Thailand, one of these dishes was usually not enough. I would order 2 and sometimes 3 “one-dish” meals. I had become accustomed to eating large portions, typical of an American diet. Now, diet back to normal and healthy, one dish is enough. Most of these dishes are served in specialized restaurants, with a half dozen or so tables, that carry only one or two things on their menus, so ordering will be quite easy. If you have trouble ordering just point and you’ll have a great meal. Most Thai luncheon meals are either rice dishes or noodle dishes. We’ll stick with my favorite rice dishes today. Because they are all rice dishes their names all begin with “khao” (pronounced like the English “cow” with a falling tone) which is the Thai word for rice. We’ll talk about noodle dishes at another time. Note on eating like a Thai: Thais use a fork and spoon with most of their rice dishes (only Chinese food, usually noodles, is eaten with chopsticks). The spoon is kept in the strong hand and the fork is used to push the food onto the spoon. Only the spoon goes to the mouth. Remember, we’re only scratching the Thai-food surface here. Where do you find it? – Look for a shop with boiled chickens hanging in the window. Lately, instead of real chickens a lot of shops are hanging plastic yellow chickens. The ones with the real chickens in the window are usually of a better quality. Whats in it? – This is a boiled chicken dish. You can either order white meat or dark, or a combination. It is served over a plate of white rice that has been made by boiling it with water mixed with the fat from the chicken. You may also be given a slice of coagulated chicken blood and maybe a slice of liver or gizzard. To some this will sound terrible I know, but the taste is to-die-for. A bowl of chicken broth, some sliced cucumbers, and a rich dipping sauce is served on the side. How it’s eaten – The sauce is spooned over the chicken one spoon at a time. Don’t dump all the sauce on the plate at once as it might be too salty or hot. If you do one spoon at a time you can flavor it just like you want (a technique you can use with all dipping sauces). The chicken and sauce are mixed with the rice. Sometimes the sauce will come with a side of chopped garlic and hot peppers. Mix them at your own peril. Some Khao Man Gai shops will also serve sliced deep fried chicken as well as the original boiled kind. The fried chicken dish is called Khao Man Gai Tawt (Tawt = fried). Where do you find it? – Similar to the Khao Man Gai shops the ones that sell the duck will have a number of roast ducks hanging in the window. So far I have not seen any plastic ducks. Whats in it? – Roast duck is sliced and place on a bed of boiled rice. The more skin and the fattier the better. Some greens are usually placed on the side and it is topped with a rich gravy. A sauce, usually dark soy sauce with some peppers is given on the side. How is it eaten? – Mix up the rice and the gravy and like eating Kao Man Gai mix a spoon of the soy sauce with the duck and rice one spoon at a time. Some Khao Naa Pbet shops also serve crispy pork (see below) or you can order a mixture of the two. Whats in it? – It’s the skin that is crispy. This dish is of Chinese origin. The pork is cooked in large slabs, sliced, and placed on top of rice. The trick to getting the skin crispy is need-to-know information – they would have to kill you if they told you. The best skin is crunchy but not hard – a work of art. It is served over rice with a gravy and a bowl of pungent soup on the side. The dish is also accompanied by the ubiquitous sliced cucumbers. Where do you find it? – If you find a shop window with hanging slabs of pork with a dark yellow crispy skin you have found the right place. It might take a while to find the shop that you will become a regular at. Mine is in a hole in the wall, just north of the 3 Kings Monument, in downtown Chiang Mai. How is it eaten? – No tricks here. Just take a spoon of the sliced pork, and some rice and crunch on. In some of the lower quality shops the pork skin may be hard so watch out for those teeth and bridges. Whats in it? – This is a pork rump, simmered all night, falling off the bone, and about as fatty as a meal can get. It comes with a quite hot and vinegary dipping sauce, and pickled vegetables on the side, and always has a sliced hard boiled egg with it. The whole thing is topped with a thick gravy. Where do you find it? – You will need to look for shop with a huge pot of pork rumps simmering in a cauldron. And behind it will be the cook holding a large meat cleaver. He/She will use the cleaver to slice off and chop up your order. How is it eaten? – The pork should be very tender. Take a slice of the pork, add a bit of the pickled veggies and some dipping sauce and eat with a spoon of rice. Note on ordering. You can order only the lean meat if you want, or you can order meat along with the skin and fat (my favorite) or if you are really crazy and don’t care at all about you cholesterol level, you can order just the skin. Whats in it? – This sometimes is called “rice gruel” although ever since Oliver Twist the word “gruel” has negative connotations, and sometimes it is referred to as “congee” (although in real congee the rice is boiled way down until it becomes creamy.) In Khao Tom you can still see the individual kernels of rice. A chicken or pork broth is prepared and then some already cooked boiled rice is spooned into the soup. It can come with chunks of floating pork (Moo) or fish or shrimp or sometimes squid. It is topped with sliced scallions and coriander leaves. And let’s not forget the main ingredient, deep fried garlic in oil. Where do you find it? – There are specialized restaurants for Khao Tom but they are hard to recognize. It is best to look around and if you see people using large Chinese style spoons slurping up a soup with rice in it then that’s your place. How is it eaten? 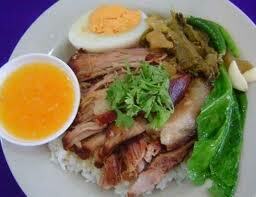 – As with lots of Thai food Khao Tom must be modified to suit your specific taste. You can add fish sauce, vinegar with sliced peppers, black pepper, and soy sauce. All the condiments will be in small bowls or bottles on your table. Keep tasting as you add flavors until it is just the way you like it. After a few times you’ll know exactly how much of each flavor to add. Khao Tom can be eaten at any time, especially if you are having stomach troubles or a hang over. But it is best as a breakfast meal, or a meal served before going to bed after a heavy night out. This is why some Khao Tom restaurants can be found open very early in the morning, and others very late at night. Whats in it? – I have it on good authority that when you die, if you have been a very good boy or girl down here, this will be the first food served to you in heaven. Khao Neow = sticky rice (here it’s the sweetened kind). It is topped with a thick, sweetened coconut milk. Ma-Muang = mango. There are more than 50 kinds of mangoes here in Thailand and only a few, the sweetest kind, are suitable for this dish. Some ground dry mung beans are sprinkled on top. Where do you find it? – Lots of restaurants serve this as a dessert but it can be bought at most open air markets. Look for the shop with the yellow mangoes and the large basin of sticky rice. Lots of people will buy the mangoes and rice and coconut milk separately and prepare it at home. Aside: As a test to see if a young girl would be an appropriate mate for her son, a woman will have the girl peel a mango (they will be quite soft for the making of Khao Neow Ma-Muang). If she can peel the whole thing without bruising the fruit then she will have passed the test. Think it is easy? Try it yourself and see how good a mate you would make. How is it eaten? – This is the good part. Mango, rice, on spoon. Enter the gates of heaven.